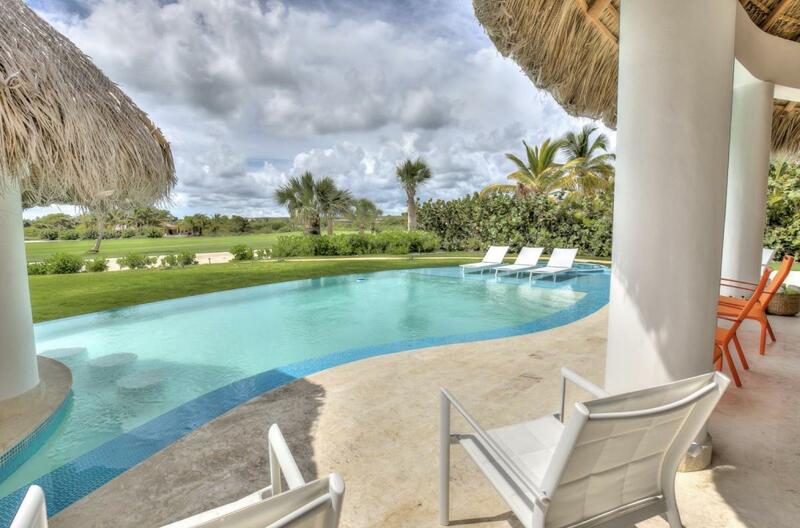 Cayuco 9 Villa is set amid the stunning green golf courses of the Caleton Club, and is just a short distance to the beach. This magnificent 6 bedroom villa is furnished with modern decor inspired by the Caribbean. The master bedroom is on the upper floor with a king size bed, an ensuite bathroom, hot tub on the balcony and a TV. Next to it you have two bedrooms with two queen size beds each, both with ensuite bathroom and television. Going downstairs you will find a bedroom with two queen size beds with ensuite bathroom and an external private hot tub and a television. The 5th bedroom has two bunk beds ideal for children with ensuite bathroom and a television as well. The last bedroom has a king size bed with television and its own private bathroom. The fully equipped kitchen has a beautiful island in the middle and it is open to a large living room. When you go outside you will be extremely impressed with the expansive patio, and BBQ area. The amazing swimming pool offers an exceptional respite from the warm tropical air, or a relaxing soak in the tub could be the perfect conclusion to a long day. Caleton Beach is about 8 minutes by car from this villa, and Juanillo Beach is about 15 minutes.